Good news for Gmail users. Gmail has enabled voice calling from within Gmail. Now you can use your computer’s microphone and speakers (or a USB headset if you like) to make outgoing calls for free in U.S. or Canada and very inexpensive calls many other countries. To see if you have this feature yet, just look on the left side of your screen under chat and look for the option “Call Phone”. Just click on it and enter a contact’s name or start dialing. The other person does not need to have a Gmail account to make this work. You can call mobile phones or land lines. If you happen to have a Google Voice account associated with your Gmail account, the receiving party will see the incoming call with your Google voice number. If you choose, incoming calls to your Google Voice number can be received right from within Gmail. Now I’m really glad I put that Google Voice number on my latest business cards! FYI – you will need to install the voice and video chat plugin which you can get at gmail.com/videochat. Other Internet telephony providers have typically charged for outgoing phone calls. Companies like Skype are extremely inexpensive, but free trumps cheap any day for me. So far, I have only received one call from someone using Gmail. A couple nights ago I received a call on my mobile phone from my friend Kreg in South Carolina who couldn’t resist testing it out before me. The call quality was about the same as typical mobile phone, with the notable exception of any dropouts hiccups or other artifacts typically associated with mobile calls. It wasn’t quite as good as our Skype to Skype calls, but to call computer to phone for free, I’d say it warrants more usage. Based on initial reports of 1,000,000 calls in the first 24 hours, I’d say it’s off to a good start. Google reports that all US Gmail accounts have the new feature enabled and they will be rolling it out to other countries soon. If you haven’t done so recently, take a look at the details of a Google Calendar event. There are now two tabs: one for the event details and one to help you find a time with another Google invitee. They also cleaned up the recurring appointment functionality. When you click on the “repeat” checkbox just under the event title, a new window appears with the details of the event. 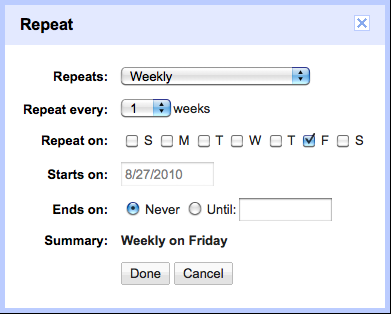 It is now much easier to create a recurring event, although I still don’t see a “Last” feature for my meeting that happens on the last Wednesday of the month. Finally, there were some reports of some Gmail messages being re-sent automatically that affected hundreds of users. Google Employee “Mr Evan” reports that the issue has now been resolved. While this wasn’t a widespread problem, it certainly was annoying when a Gmail user sent a message only to get a response back saying “I already got your message.” If you were affected, rest assured that this bug is resolved. This past week were three main stories for Gmail and related apps. First, a new labs feature allows you to search in to your Google docs. Next, Gmail on the iPad got a nice touch to clear up some confusion, and finally, Google now supports voice and video chat on Linux. First up, you can give Gmail the ability to reach in to your Google docs by enabling the labs feature called Apps Search. Turn this on the same way you would any other labs feature by clicking the Settings link in the upper right, click the Labs tab, scroll down to the Apps Search section, click Enable, the click Save Changes at the bottom of the screen. Now when you do a search, Gmail will not only list your search results in a familiar conversation index listing, but also include a section at the bottom for documents, spreadsheets, presentations, and other Google docs data that matched your search criteria. As a side note, I noticed that the labs features are now grouped with the enabled labs at the top and the disabled, or available, labs at the bottom. If you’re looking for something new, start scrolling until you get to the Available Labs section to save a bit of time. Next, Gmail made a slight adjustment to the user interface on the iPad to clear up some confusion that I, and some of you, have experienced. As you may have noticed, when you select messages on the left, a panel appears at the bottom left with buttons for Archive, Delete, and other options. For dealing with individual messages, the buttons on the upper right were used. Thankfully, Google was able to take advantage of CSS3 technology and remove the extra set of buttons on the left. Now when you select multiple messages, they are stacked in the window on the right. The buttons on the lower left never appear and you only need to use the right side buttons for archiving, deleting, and other actions. Perhaps they’ll hear my other request make it easier to apply labels instead of scrolling and scrolling and scrolling. Finally, Ubuntu and other Debian-based Linux users can now use voice and video chat. Just visit gmail.com/videochat to download the plugin. Google doesn’t often neglect the Linux community, but they took almost two years to implement this feature. They promise to have RPM support soon. If you’re a regular Gmail Podcast listener, you’ll notice that I recently updated the Contacts and Groups podcast to be more accurate with the current user interface. That was done just in time for Google to update the interface one more time. While most of the Gmail Podcast content is evergreen, every once in a while they do a feature update that renders some of this content obsolete. I just didn’t think it would be a week after I released a cast on groups. So what’s new with the interface? At first glance, not much. If you look closer at the main page, you’ll see on the left, Mail, Contacts, and Tasks are now grouped together. If you hover over the Mail link, you’ll see a little dash appear to the right. Clicking that expands or collapses the trio of Mail, Contacts, and Tasks links to clean up your screen a bit. Also, Compose Mail is now a button instead of a link, and the other gadgets below the labels have been cleaned up. The buttons and links at the top of the conversation index have also been cleaned up. Rather than links to select all, none, read, unread, starred, and so on, there is now drop down list to the left that has multiple selections. A nice touch in my opinion. Another nice touch that is often overlooked is the fonts. It’s subtle, but I think it gives Gmail a crisper look. Finally, the main changes to this update in Gmail have been to the contacts and groups management. When you click on contacts, the three column display has been replaced with a list that looks more like the way conversations are managed in Gmail. Groups are applied like labels, although they are displayed on the far right of each entry instead of somewhere in the middle like conversation labels. Like the conversation index, a dropdown list is available above the list to the far left of the buttons to select all or none of your contacts. If you select one or more of your contacts, and go back to the conversation index, when you come back, those same contacts are still selected. Nice job Google developers! Some other very nice features like sorting by last name (available under the More Actions drop down list), and my favorite, keyboard shortcuts have also been added. Clicking any one of the contacts presents a display that is significantly different than its predecessor. The layout includes all the standard fields you would expect, photo, name, phone, address, email. It also has a larger notes section and at the bottom of the left side there is an “Add” dropdown list that allows you to add additional fields in case someone has more than one email address, phone number, a nickname, or whatever. You can even create your own customer fields. And of course, there’s a link to display recent conversations with that contact which can really help with those old archived conversations. As mentioned earlier, managing group membership with your contacts is now very similar to applying labels to your email conversations. If you are at the contact index, you can search, select, and use the Groups dropdown to apply or remove the groups you wish. I did a quick search for Jerry, came up with six hits, quickly selected all and created a new group called Jerry. Now if I want to send a quick message to all my contacts named Jerry, I compose a new message and start typing “Jerry” in the to field. Along with the six possibilities, I also get one with the suffix “(group)” and I send to all six at the same time. From the Contact details screen just pull down the Groups list and select the groups you wish to apply or remove. You can even type a new name and create a new group, again much like labels. You will probably notice that there is no Save Changes button on the contact screen. That’s because all changes to the contacts are now auto saved. Thank you again Google Developers. And don’t forget about hitting “?” on the new contacts screen if you have shortcuts enabled in your settings to manage your contacts more effectively and efficiently. Let’s begin by creating a group. Start by clicking on the Contacts list on the left side of the screen. You’ll be presented with a screen with three columns. The first lists your groups, the middle column lists the members of the group you select, and the right column displays the properties of the contact or group selected. Next, select one or more contacts from the middle column by clicking on them, using the checkboxes next to each name, or using shift-click, or control-click to select multiple contacts, then click the icon just above the left column with a plus and two people. A dialog will appear prompting you for a name for the new group. Enter a name and click OK. The selected names will automatically be placed in the new group. If you don’t want to select any names, you can still create a new group using the same icon. Once you have created your group, you can add contacts by selecting the names in the same way as above, checking the checkboxes, shift-click, or control-click ranges of names, then use the Groups button above the right column to add them to an existing group, or create a new group. You can also rename a group by highlighting the group name, and clicking the Edit button on the right column. Just type in the new name and click Save. If you find you no longer need a group, simply select the group for the left column, and click the Delete group button above the right column. This will remove the group and not the contact information. If Kreg is a member of group Podcast Listeners, and I delete Podcast Listeners, I still have all of Kreg’s information. You will be given a warning because removing a group cannot be undone. Now that you’ve got groups defined, you can simply type the name of the group in the To, Cc, or Bcc fields when you are composing or replying to a message. Groups will be listed in the auto-complete list in italics and have a suffix of “(group)”. After entering the name of the group, hit the tab or enter key and Gmail will replace the group name with the names of the contacts in that group. You can create groups with as many contacts you like. However, in an effort to fight spam, Gmail won’t let you send a message to a group containing more than 500. Few things from Google fall short of “fantastic” for me, but the new feature to login to multiple Google accounts at once was met with a solid “meh”. My original thought was “great, now I don’t need all those accounts under ‘send mail as’.” Such was not the case this time. Per Google’s posting on the Gmail Blog, they say you can login to two Google accounts at once, however there are some gotchas. 1) Not all Google services support multiple account sign-in yet. For the services that don’t support it (like Blogger and Picasa Web Albums), you’ll be defaulted to the first account you signed in with during that browser session. So if you click a link from Gmail to Blogger, for example, you’ll be logged into Blogger with the first account you signed in with, even if you clicked the link to Blogger from your second Gmail account. 2) We’re still working on making Gmail and Calendar work offline with multiple sign-in. If you rely on offline access, you probably don’t want to enable this feature quite yet. 3) Multiple account sign-in only works on desktop browsers for now, so if you use Gmail on your phone’s browser you won’t see this option yet. Since Google Apps customers can already sign in to their accounts at the same time as their personal Google Accounts, we won’t be adding this new feature to Google Apps until the new infrastructure is in place. This doesn’t do anything for me. It only supports up to three Google accounts, not all apps are supported, and hosted email addresses won’t be coming along for a while. What’s the big deal everyone has been jumping up and down for? OK, setting up shared calendars can be a bit of a pain, but once it’s done, you get to use those calendars on your iPhone, iPad, iCal, and other places. As for shared Gmail, that’s already been answered and I’d rather switch at the top of the message using a centralized account with the Send Mail As feature (read: change the sender on the fly) than switch to a different account to check that mail. For usefulness, I give this feature a 2 out of 10. Maybe I’ll see more value when the hosted accounts can play. 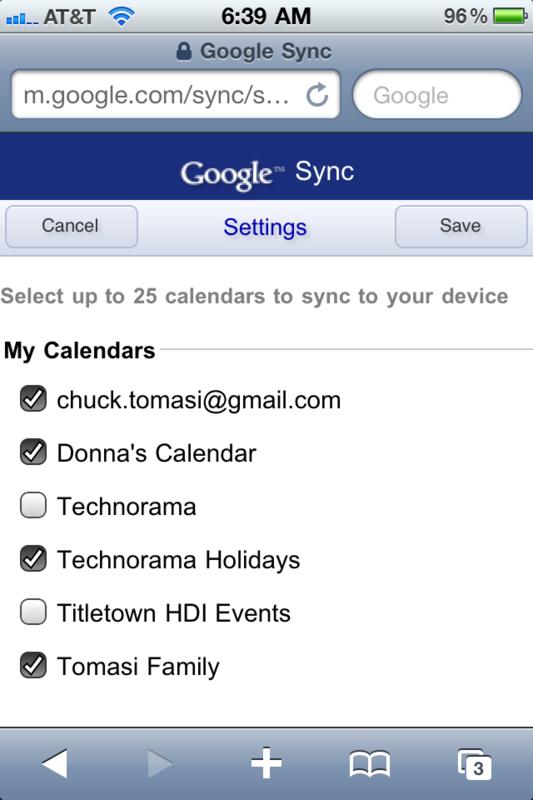 About a year ago I setup my iPod Touch to sync with my Google calendar, my wife’s calendar, and a couple others. I recall going to the various calendar settings to get obscure IDs, then setting each one as a separate account in the device’s settings, and modifying URLs under the advanced settings. To say it was painful was an understatement. Last night when I started looking for those old Google help files, I was surprised to find a much easier way. Go look at your calendar on your iPhone and you’ll see the new calendars show up. It’s as simple as that. I’ve done this on my iPhone 4 and my iPad and just love having the various calendars at my fingertips to avoid the annoying situation where I book an appointment when my wife already had something in that spot. Colleague and fellow Friends in Tech member, George Starcher joins me for a look at his experience deploying Google Apps in the enterprise. This podcast runs a little longer than our normal format because it digs in to many aspects you should be aware of if you are thinking of replacing your legacy apps with a cloud solution. Try GotoAssist Express free for 30 days. One of the things that has annoyed me about web-based mail services like Gmail is when I click on an email link on a web page or document, the computer starts up Outlook, Mac Mail, or some other locally installed mail app instead of my favorite – Gmail. If this issue has bothered you, then I have a solution for you. This podcast covers the steps necessary to make Gmail your default email program for the big four browsers, Firefox, Chrome, IE, and Safari. Some solutions require additional software be installed. Links to those applications are provided in the posting on the website. Firefox users have the easiest time. Just open Preferences for Mac Users, or Tools> Options for Windows users, then select the Applications tab from the top. In the search box, type mailto and change the selection to read “Use Gmail”. If you use more than one email program, then you can choose “Always ask”. I would think Chrome would have been the easiest since it’s a Google product like Gmail, however at this time your best bet is to install an extension called Mail Checker Plus (http://bit.ly/bUs51I). Mail Checker Plus also has some nice features to let you preview messages, and indicate how many unread messages you have on the toolbar. Mac Safari users are also required to install an additional piece of software called Google Notifier (http://bit.ly/bYxrC7). Once the software is installed, the trick is to go in to the preferences in the Mac Mail app (not Safari), and change the Default email reader option to Google Notifier. Sorry, I don’t yet have a way for Windows Safari users to do this trick. Internet Explorer is probably the most complex solution to use Gmail as your default mail application. It’s actually a little more complex than I have time to cover here so I’m only going to mention that the best solution I’ve come across is a free third party application called Affixa Basic (http://bit.ly/cT8BIR). I subscribe to the KISS, or Keep it Simple Stupid, philosophy. If there’s an easy way to do something, use that. Firefox is my choice if you like an easy way to click a link and open Gmail. This show is sponsored by GotoAssist Express. Try it free for 30 days. Whether you are just getting started using Gmail or have been using it for years, this cast will help you manage your contacts. If you are new to Gmail, you are likely typing in the email address of the person when you send them email. For example, chuck@chucktomasi.com. A more effective way is to use the Gmail contacts list. Once information is in there, you can simply start typing the name of the person and Gmail will find the contact and use the proper email address. Begin by clicking the link on the left that says Contacts. You’ll see three columns in the main window. The left column lists group names. You can organize your contacts in to groups such as friends, work, rocket club, and so on. Gmail provides a few examples to help get you started, but you can configure these any way you like. I cover groups more in another podcast. The second column lists the individual people in your contacts list. You may see some names listed here already even if you haven’t used Gmail much. (You see) Gmail learns these by analyzing the email you’ve previously sent. To add a new contact, click the icon in the upper right with a plus and a single head. At a minimum, provide a name and email address and click save. Note the email field is red until Gmail determines you have entered a valid email address consisting of an “@” sign and a domain such as .com, .org, and so on. If this person has more than one address, click the little blue “add” link to the right of the Email label to enter more addresses for this person. You can also add phone numbers (handy for using Google Voice), addresses (useful for Google maps), and even a photo of the person. If you need to update someone’s contact information, just highlight their name from the middle column and click the Edit button above the details column on the right to update existing information or add any new data. Deleting a contact is also quite easy; just click on the name or check the checkbox next to that entry and use the Delete contact button in the upper right of the contact details. Checking more than one contact allows you to delete multiples at the same time. The contacts database is also useful if you are trying to find a conversation you had with someone. Often times I want to verify someone sent me something or I sent something out. I can’t always remember keywords or dates to search on, but I do remember who the conversation was with. To find that mystery conversation, simply click on the person’s name, and just below their details in the right column, there is a link reading “Recent conversations: Show”. Clicking on the show link does a search for any messages to or from that person. As your contacts list starts to grow, you can also use the Search contacts field above the three columns to help locate names and addresses more quickly. Over time, you may also find that Gmail has collected multiple email addresses or entries for the same person. For more information about merging contacts, I recommend listening to the Dec 2009 podcast on merging duplicate contacts. I also have information how to import your contacts from another mail service such as Hotmail, AOL, Yahoo, and other systems from June 2009. Listen for upcoming podcasts on managing groups, importing from a CSV file or spreadsheet, and synchronizing contacts between Gmail and other services like Outlook or your iPhone.